"I stood in the square talking to East Germans and asked them what they were going to buy. They said first of all, Südfrüchte . . . tropical fruit, a very understandable thing because they didn’t have nearly as much of that as they were seeing West Germans and West Berliners having everyday on television. But the second thing they said surprised me: the second thing was toys. They explained that their children also watched Western television and the most important thing that they could do for a child or a grandchild was take back a toy that was visible on Western television but not available in East Berlin. That evening my wife and I went through Checkpoint Charlie to East Berlin to our embassy there. And as we went through Checkpoint Charlie we were controlled in the usual way, checked by Soviet personnel, but beside us running through the checkpoint uncontrolled completely were thousands of Easterners who’d spent the day in the West Berlin and were going back. And in that crowd I saw a little boy – I think he was three or four – and he was pulling a large plastic red London double-decker bus, approximately his own size. And I thought, well, if a London double-decker bus can be crossing from west to east on the Iron Curtain, something really big really is happening." These are the words of Sir Christopher Mallaby, Britain’s Ambassador to West Germany, who had flown from Bonn to Berlin on 11 November 1989, barely 24 hours after the opening of the wall that had divided the city since 1961. 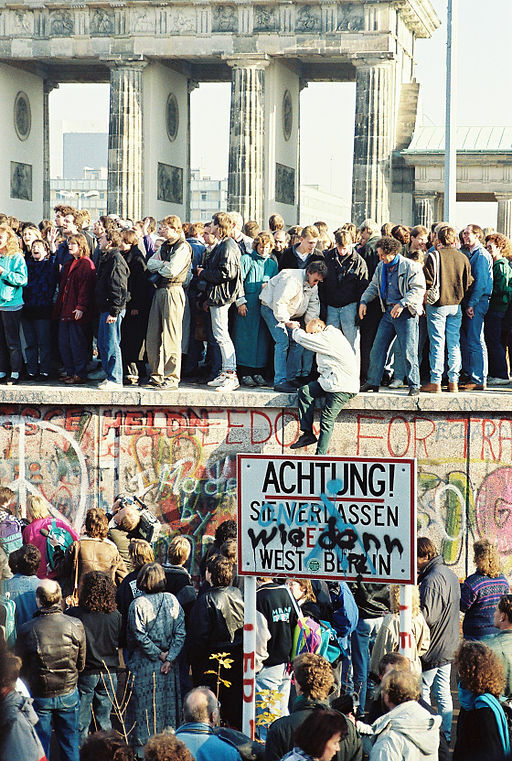 The opening of the Berlin Wall 25 years ago this month is a prime example of the role of accident in history. Early in the evening of 9 November the East German Politburo’s media spokesman Günter Schabowski made a confused statement about new regulations allowing citizens to travel to the West, which he said would come into effect ‘immediately’. Journalists took him at his word, the message got out through West German television (which nearly all East Germans could watch) and by 10.30 p.m. thousands had gathered, most of them at the crossing on Bornholmer Strasse. Most just wanted to see the other side and then return home. Crucially, the border guards in every case decided not to fire on the crowds but to let them through – and the vast majority did go back, having bought their fruit or children’s toys. The Wall had been breached and the Cold War was effectively over. But none of this would have happened if the GDR leadership were not already disorientated and demoralised. For months East Germans had been on the move and on the streets. The opening of the border between Hungary and Austria on 10 September was a milestone, allowing the thousands of would-be emigrants who had gone on ‘holiday’ to other Soviet bloc countries to travel freely to the West. They were followed by the special trains which took East Germans through their own country from Prague to the Federal Republic, greeted by cheering crowds at every station they passed through. Huge demonstrations took place in Leipzig and Dresden (witnessed at first hand from KGB headquarters by the future President Putin). Crucially, the East German leadership, which had been preparing a Tiananmen Square-type crackdown in Leipzig on 9 October, lost its nerve. They already knew they would not have the support of the man who held the fate of the GDR in its hands. Visiting East Berlin to celebrate the 40th anniversary of the GDR, the Soviet leader MikhailGorbachev had told his counterpart Erich Honecker that ‘dangers await only those who don’t react to life’. The destabilisation of the GDR, along with all the other countries of the Soviet bloc, was the result of the momentous changes unleashed by Gorbachev after becoming General Secretary of the Communist Party of the Soviet Union in 1985. But Gorbachev in turn would not have been in that position without the pressure for change induced by the strains on the Soviet Union’s economy and society imposed by President Reagan’s hardline policies in the early 1980s. Nor would he have been accepted so readily as an interlocutor with the West if he had not been endorsed at the outset by Mrs Thatcher as ‘someone we could do business with’. One context for the fall of the Wall is therefore the accelerating disintegration of the Soviet empire in eastern and central Europe. Another context, however, is the ‘German question’ or ‘German problem’ which had existed ever since the creation of two German states as a temporary solution to the Cold War impasse in 1949, along with the preservation of West Berlin as a Western enclave deep inside the territory of the GDR. Berlin above all was the embodiment of east-west division, still under four-power control and still governed by the temporary travel arrangements which had allowed the West to supply the Western zones by air and defeat the Soviet blockade in 1948-49. All of these arrangements, including the very existence of two German states, were called in question by the actions of the East German people in the summer and autumn of 1989: all the more so as the slogans on the street changed from ‘German freedom’ to ‘German unity’. Most people in the West had become quite comfortable with a divided Germany. West German leaders were naturally committed to the reunification of their country, but were as much taken by surprise by the events of 1989 as everyone else. Their Western allies – Great Britain, France and the United States – had also been committed since 1952 to ‘a reunified Germany enjoying a liberal constitution, like that of the Federal Republic, and integrated within the European community’. But they also had serious reservations. A reunited Germany would overturn the stable east-west strategic balance: the Warsaw Pact on one side, NATO on the other. It would be far larger than its neighbours in terms of both population and economic power. And lurking behind these anxieties were memories of Germany’s history: its role in the outbreak of two world wars and its dreadful record of racial extermination. Western leaders responded in different ways. President François Mitterrand of France told Mrs Thatcher that the Germans ‘might make even more ground than had Hitler’, but went on to do a deal with Chancellor Helmut Kohl that traded French support for unification in exchange for the further deepening of European integration. George C. Bush, still less than a year into his term as President of the United States, was far more positive. He had already spoken of West Germany and the USA as ‘partners in leadership’; now he and his advisers were confident that they could seize the initiative and steer the unification process to bring about the previously unthinkable: a peaceful end to the Cold War. The ecstatic greeting given to Kohl when he visited Dresden on 19 December convinced him that the process could not be slowed down: he and his fellow politicians would simply have to ride the storm as best they could. During the course of the next few weeks, as the East German leadership wavered and crowds stormed Stasi headquarters, both the Soviet leadership and the Western allies came to the same realisation. They had to find a way to meet German aspirations while not destabilising the international system. The ‘Two plus Four’ formula adopted in February 1990, by which the two German states would negotiate with the four occupying powers, proved successful: not least because Gorbachev made the key concession that a united Germany would be free to choose which alliance it wished to belong to. Germany chose NATO and unification was achieved on 3 October 1990, less than a year after the fall of the Wall. If the events in Berlin were inseparable from what was happening in the Soviet bloc and in the rest of Germany, those events also took place within a broader global context. And this context helps to explain the role of the United Kingdom, widely perceived as being the least positive of all the major allies towards the prospect of German unity. This had much to do with the attitude of the Prime Minister, Margaret Thatcher. Her reservations about German unity were well known. She expressed them very publicly at the time and made no secret of them in her memoirs. But she strongly supported the aspirations to freedom of countries such as Poland and even the GDR (if existing national boundaries were not threatened). As she wrote in March 1990: ‘while in the past, history was determined by the personalities and ambitions of the rulers of the people, in future it will be decided much more by the character of the people’. Mrs Thatcher was also worried that if unification proceeded too rapidly it would jeopardise the position of Gorbachev and his reform programme in the Soviet Union. However, despite her public warnings she did nothing to impede the Two plus Four process and British ministers and officials proved highly constructive negotiators, helping to solve many complicated legal entanglements. But the United Kingdom was also preoccupied with events outside Europe, many of them the legacy of Britain’s imperial heyday. There were success stories. In South Africa, apartheid was unravelling and British diplomats were giving their support to the reform efforts of President F.W. de Klerk. Nelson Mandela was released from prison on 11 February 1990, just two days before the Two plus Four agreement was reached in Ottawa. Two days after that decision, in Madrid, Britain resolved another long-standing post-imperial issue, reaching an agreement with Argentina which restored diplomatic relations for the first time since the war of 1982, while postponing discussion of the question of sovereignty over the Falkland Islands. There were also major problems. Britain faced a serious diplomatic confrontation with the United States over the fate of the Vietnamese boat people seeking refuge in Hong Kong. Agreement on their ‘non-voluntary’ return from Hong Kong to Vietnam was reached with the Vietnamese government on 22 November 1989 and the first repatriations took place on 12 December. The agreement provoked fierce criticism in Britain – ‘For a day or two I was treated by liberal people as a descendant of the Gestapo and imitator of the Holocaust’ – recalled Foreign Secretary Douglas Hurd, and dissent from some of his closest advisers, including the Ambassador in Washington. It is understandable that it was this issue and not Kohl’s Ten Point Plan which was uppermost in Hurd’s mind at the end of November 1989.